How can you not love a brownie? It is the perfect little, moist, chocolate delivery system ever created. You can dress it up with nuts and frosting, or go classic and minimal with just the cocoa goodness. It can be sweet, festive and be paired perfectly with milk, OR it can come across a bit more subtle, mature and enjoyed with coffee or red wine. It all comes down to how you want create it. Most people have a favorite *type* of brownie. Mine have always been the not too sweet, no frosting, very dark chocolate (with a hint of coffee) variety. As far as nuts, I could go either way. Enter our friend, Baker Beth. You know her from so many glorious Cookie O' The Month creations and recipes here on this blog. Beth is a fan and a maker of the frosted brownie. With nuts. I was a tad skeptical. I felt a great brownie stood alone in it's brownie-ness and did not need the razzmatazz (if you will) of another layer of sweet goop. She persisted. I held my ground. She sent me a batch of her frosted brownies. You can read what happened next AND get the recipe (You Will Want It) HERE. I think you can can guess what happened, given the above photo and the text on it. It's worth reading Beth's story on the subject because not only is she a stellar baker, she is also a writer and editor. It's her day job. Plus, there's the recipe. Make them and judge for yourself. 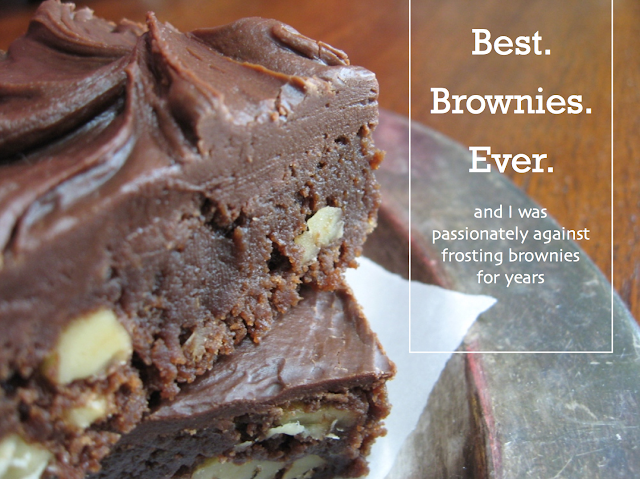 an amazing story of brownie conversion (frosting never crossed my mind as an option). I must/must not try them! David will have them on his blog! I wrote brownies into my unpublished book! I think we all have a brownie obsession!